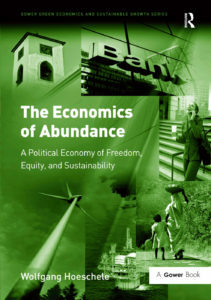 In this book I worked out the idea of an “Economy of Abundance” as an alternative to our present economy of scarcity. Following is the text from the back cover of the book. No matter how many resources we consume we never seem to have enough. The Economics of Abundance is a balanced book in which Wolfgang Hoeschele challenges why this is so. He claims that our current capitalist economy can exist only on the basis of manufactured scarcity created by ‘scarcity-generating institutions’, and these institutions manipulate both demand and supply of commodities. Therefore demand consistently exceeds supply, and profits and economic growth can continue – at the cost of individual freedom, social equity, and ecological sustainability. The fact that continual increases in demand are so vital to our economy leads to an impasse: many people see no alternative to the generation of ever more demand, but at the same time recognize that it is clearly unsustainable ecologically and socially. So, can demand only be reduced by curtailing freedom and is this acceptable? This book argues that, by analyzing how scarcity-generating institutions work and then reforming or dismantling them, we can enhance individual freedom and support entrepreneurial initiative, and at the same time make progress toward social justice and environmental sustainability by reducing demands on vital resources. This vision would enable activists in many fields (social justice, civil liberties, and environmental protection), as well as many entrepreneurs and other members of civil society to work together much more effectively, make it more difficult to portray all these groups as contradictory special interests, and thereby help generate momentum for positive change. Meanwhile, for academics in many fields of study, the concept of the creation of scarcity or abundance may be a highly useful analytical tool.